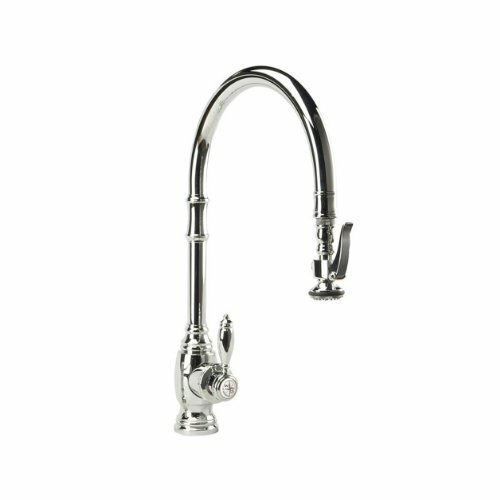 If you’re looking for a kitchen faucet that will impress all your guests, you have to check out every model produced by Waterstone. 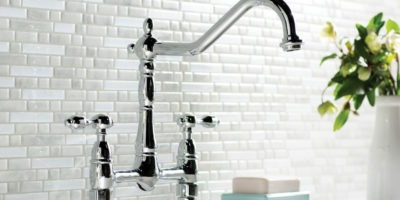 All Waterstone faucets are handmade, and the amount of detail implemented in the product is simply amazing. Every line is smooth or curved exactly as it should, every inch of the finish looks exactly the same, and most importantly, the faucets are very efficient and durable. When it comes to kitchen faucets, there are only a few manufacturers that can compare their products with those developed by Waterstone. Their products have the right mix of attractiveness, originality, and functionality, so they won’t only look good, they will actually help in the kitchen. Read the following Waterstone faucet reviews to learn more about these amazing products. The Waterstone 5500 Annapolis is a kitchen faucet that has a traditional C-Spout design. The faucet looks amazing, and it’s bound to turn heads and catch the eye. This faucet will look great in every kitchen, whether it has a modern or a traditional design. This faucet has a pull-out spray head, so it will be very efficient at washing large pots and pans. The sprayer is very easy to pull, thanks to a counterbalanced weight implemented on its top. A PLP positive lock will keep the sprayer in place without any problems. The Waterstone 5500 Annapolis has an amazing design, and all its lines and details are clean and crisp. Narrow Nut – The nut at the base of the faucet is narrow, so it will barely cover the sink’s hole. You can buy a larger nut from a local shop for a small fee. Conclusion: The Waterstone 5500 Annapolis will look good in every kitchen, and it will improve your home’s design. The Waterstone 5600 Annapolis has a traditional C-Spout design. Despite the traditional design, this model will look great in both modern and traditional kitchens, and it will easily become the centerpiece of the room. The first thing you notice when you see this model is the attention to detail the manufacturer implemented in every single element. Every line is straight or precisely curved. The spray head is easy to pull and easy to place back in the lock. The lever used for changing the spray patterns is sturdy yet easy to use. Everything is exactly as it should be. The Waterstone 5600 looks great, and it will improve your kitchen’s design. This is the kind of faucet that will attract a lot of compliments from your guests. 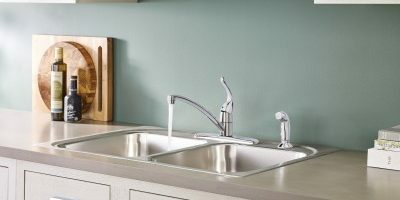 Unique Design – This faucet has a unique design that will look great in every kitchen. Heavy – Weighing about 14 pounds, this is a heavy faucet. You should have someone helping you when you install it. Conclusion: The Waterstone 5600 Annapolis has a great design and it’s also very functional. The faucet will make a great addition to every kitchen. Waterstone is based in California, USA. 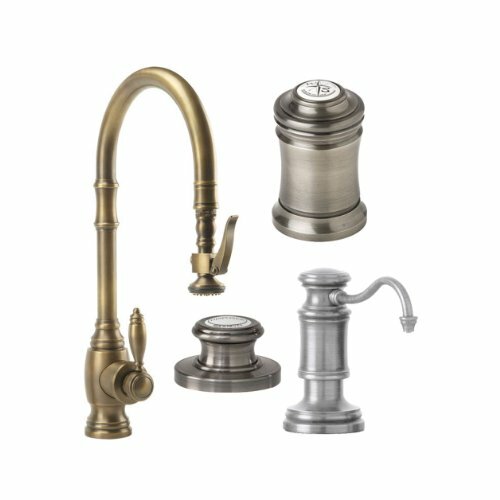 They are a luxury faucet manufacturer, and they are renowned for their unique design. Waterstone is a fast-growing company in the faucet industry, and you can be sure you’re going to hear more about them in the future. All the faucets developed by Waterstone have an original look. 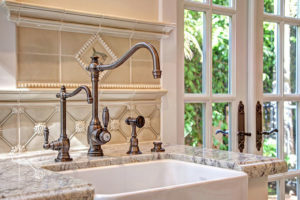 They usually rely on a classical design, but the amount of detail implemented in all their faucets make them great for both traditional and modern kitchen designs. Their faucets are so sought after because they are completely handmade. This allows every faucet to be unique, even though it will be built in a similar style with others. The manufacturer offers a large variety of finishes, so you’re bound to find one that will look amazing in your kitchen. Every faucet is handmade, so unless the manufacturer has some faucets in stock, you will have to wait for a while before you receive one. However, because they are handmade, you can rest assured that the faucet you receive will have the best quality available. The faucet will also be tested before it’s shipped, so you will receive a working unit. If you talk with someone about luxury faucets, you will most likely hear a lot of Italian or French names being passed around. Well, this should be a thing of the past. Waterstone is a luxury faucet manufacturer that produces high-quality faucets right here in California. Waterstone faucets are not only great-looking, they’re also very efficient. Their products cover a large range of options, so you can surely find the faucet type you want among them. All Waterstone products are handmade, so they will be exquisite and unique at the same time. Even though the faucet will be built in the same design as others, it will have elements that separate it from the group and make it unique. The amount of detail implemented in these faucets is simply amazing. As you could see from our Waterstone faucet reviews, these are truly luxury products and they will fit nicely in every modern or traditional kitchen.